Roadworks on Bourges Boulevard which have caused long delays for motorists will be extended. 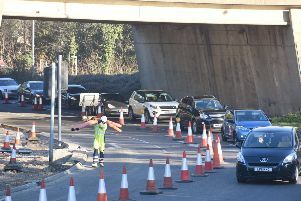 The 23 week project began at the start of February and was due to end in July, but Peterborough City Council has confirmed works will now not completely finish until August to allow for additional carriageway resurfacing. The scheme will see a right turn into the long-stay station car park installed from near Priestgate, to go alongside new traffic lights and a new pedestrian crossing. Works will also include introducing a ramped entrance into the car park, which will also have new parking spaces created, along with a footpath and verge. The council said there is not enough capacity to incorporate a right turn coming out of the station car park. When the works were announced, Cllr Peter Hiller, the council’s cabinet member for growth, said: “The work is being carried out as part of the council’s growth agenda, with a long term view to opening up the future development potential of the site. The project is costing £1.4 million which the council is receiving as a grant. A previous £4.5 million scheme on Bourges Boulevard, just past the Queensgate roundabout, which caused long city centre delays, lasted from May 2014 to July 2015.